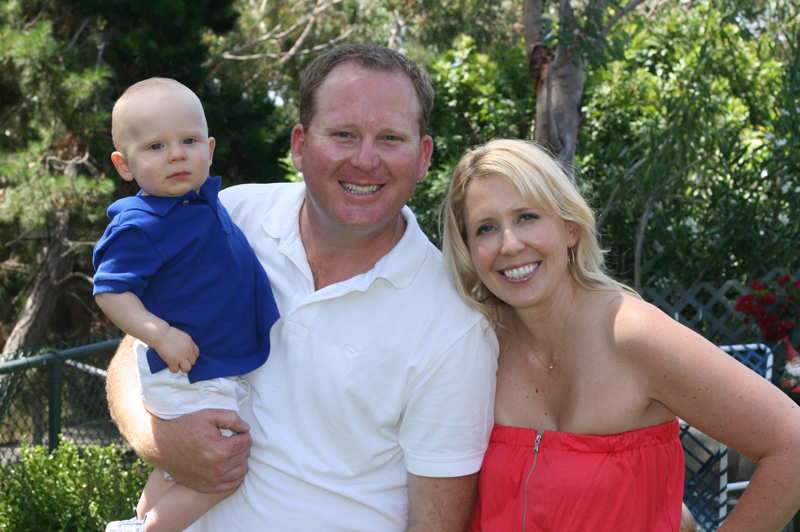 Last weekend my sweet little nephew, Nolan, turned one. 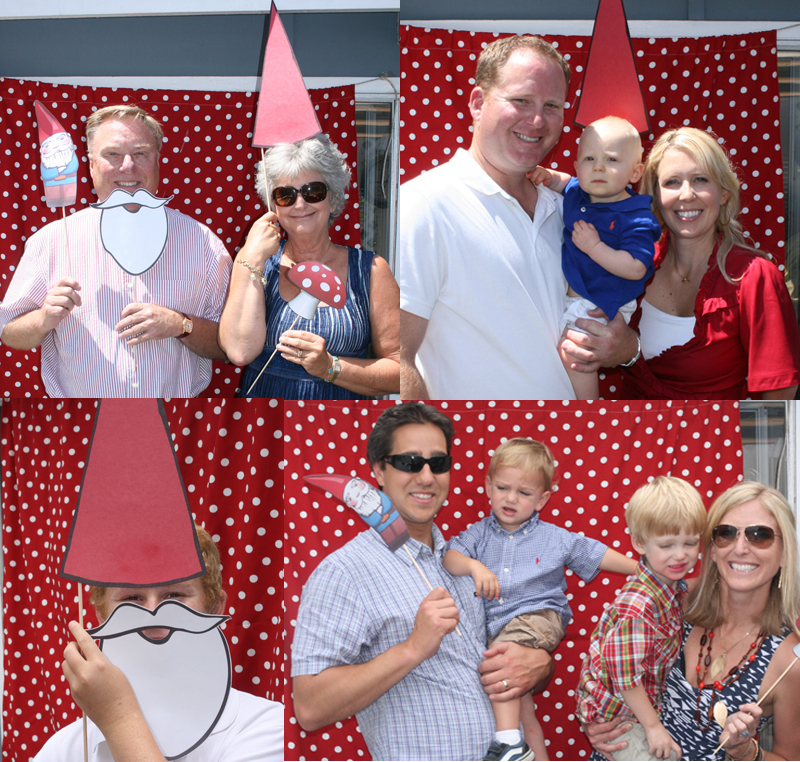 To celebrate my brother, Jeff & and sister-in-law, Kelly, put together a gnome party for him. I helped with the paper goods and thought his named needed a “G” added for the occasion. Good sports they are, they went for it. 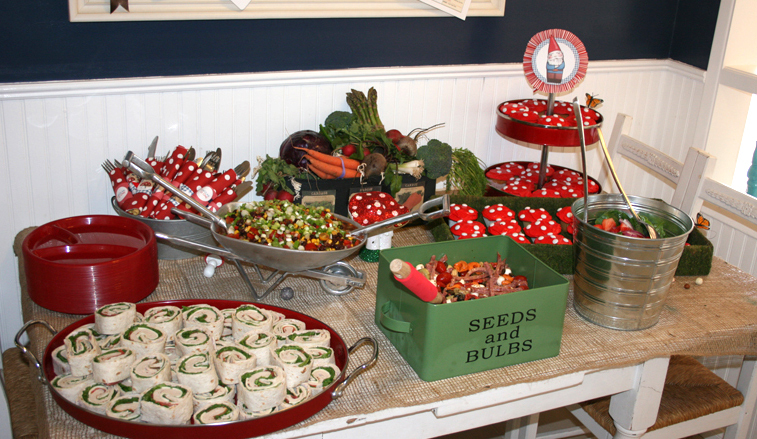 My mom had a very heavy hand in this party. She did all the tables, cute-ified the signs, and made the most darling kid’s table I’ve ever seen… but we’ll get to that in a second. 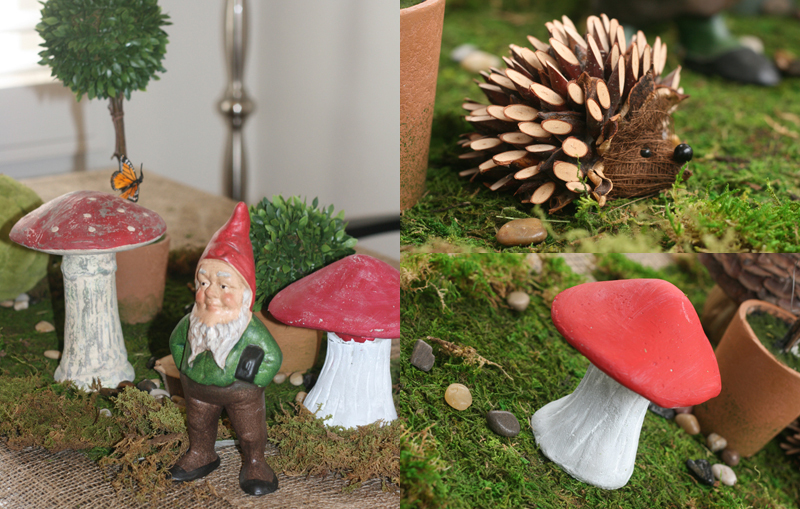 I do have to say right away that the cute gnome you’ll see repeated throughout is NOT my design. I pulled it from the internet via pinterest or google (can’t remember) but I just thought it was too cute not to use. As far as the gnomes go, my quirky brother (the same proud owner of the chola and cholo from this party) has quite a collection. 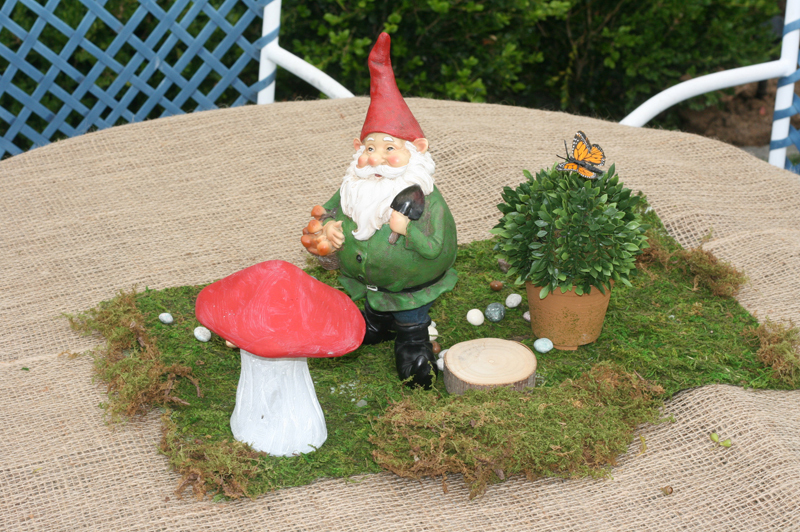 My mom added a few of hers and some funky mushrooms she collected and we were rolling with the gnomies quite easily. 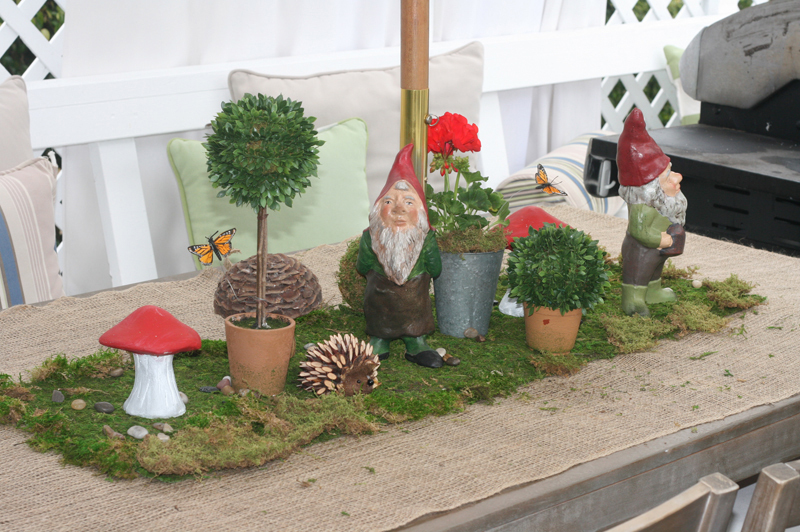 My mom and Kelly covered the tables in burlap, then put sheet moss as a runner on top. 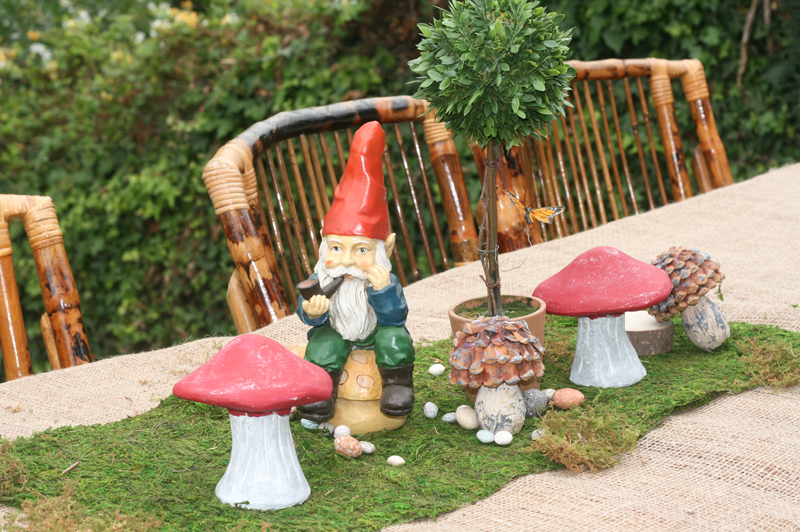 Throw in some mushrooms, wood slabs, butterflies, rocks, hedgehogs, and of course a gnome or two, and you’ve got yourself a party. I think they did such a great job! 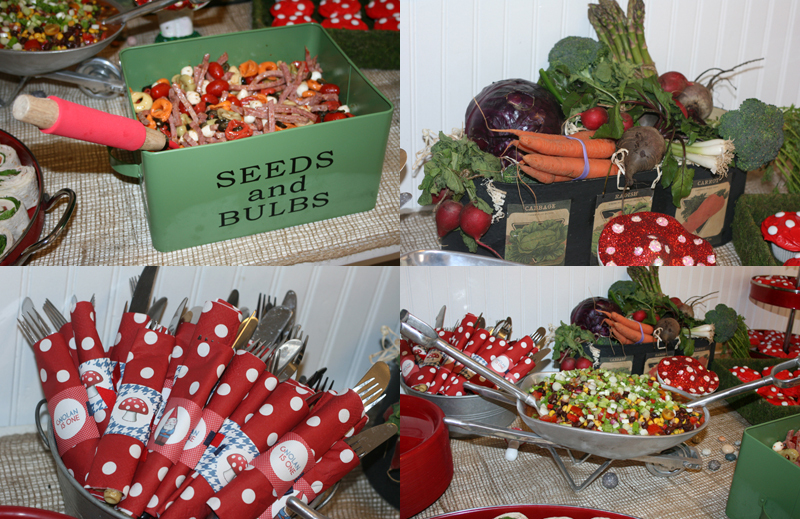 I know the woodland theme is big right now so it was fun to have so many inspiring parties as reference points. 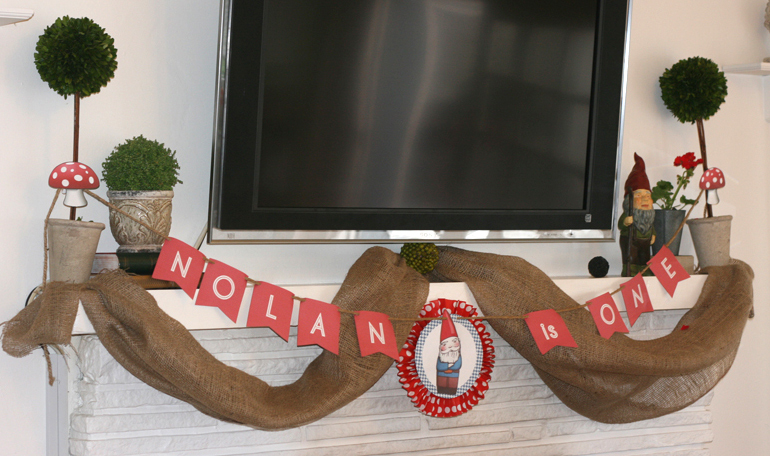 Here’s a view of the mantle: And my favorite part of the party? This kid’s table! 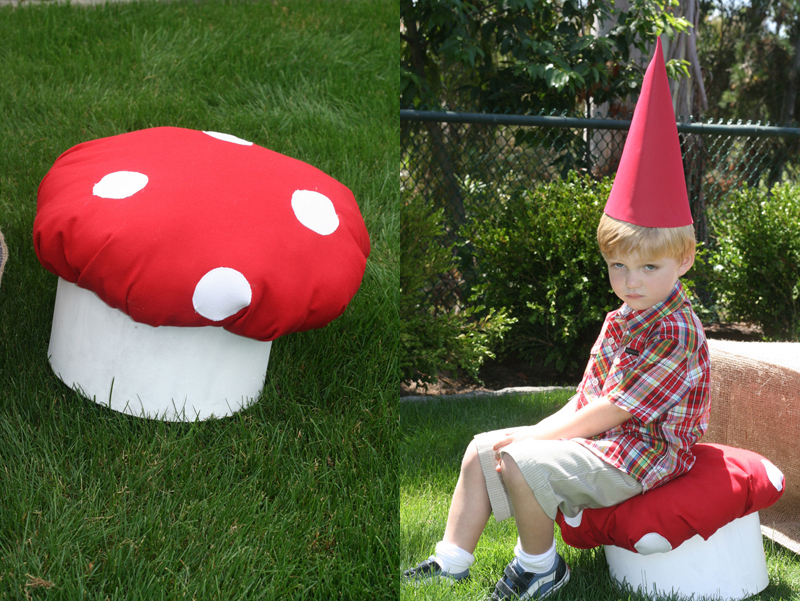 Complete with gnome hats! So cuuuuuuuute! Crafty Jan strikes again! 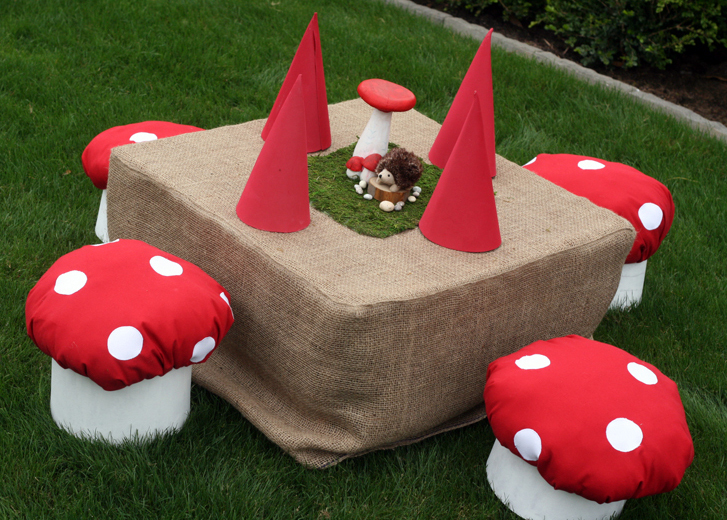 She made those mushrooms from paper-mache cylinder boxes. 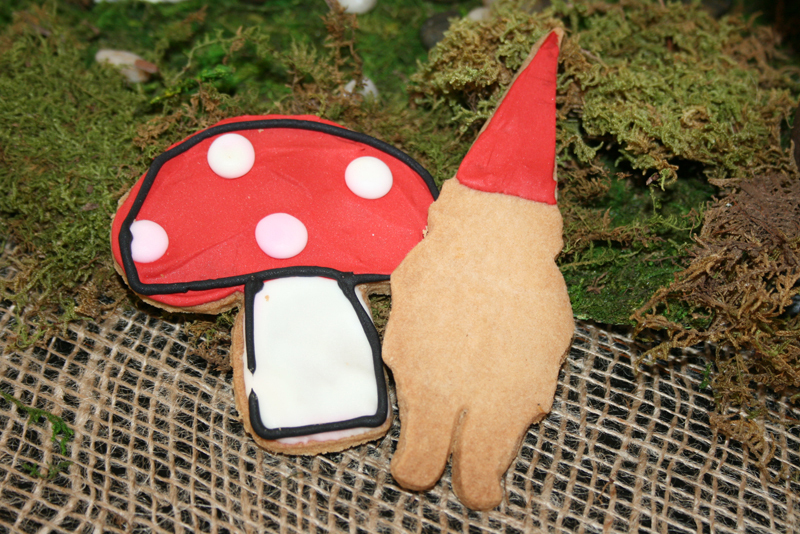 She sewed the mushroom cap on top and they were just too cute for words. 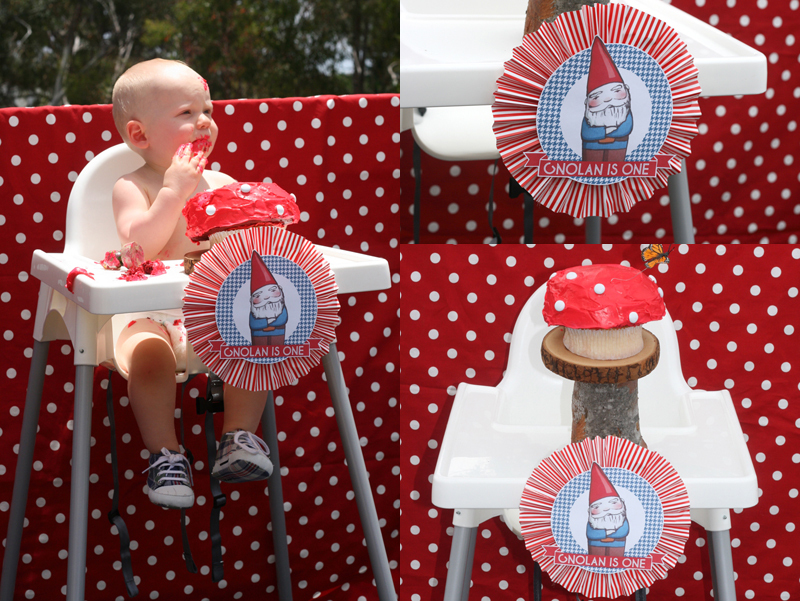 Four gnome hats on top of the table actually got worn! I was shocked! The kids loved them, though my son doesn’t look so thrilled in this photo! Ha! 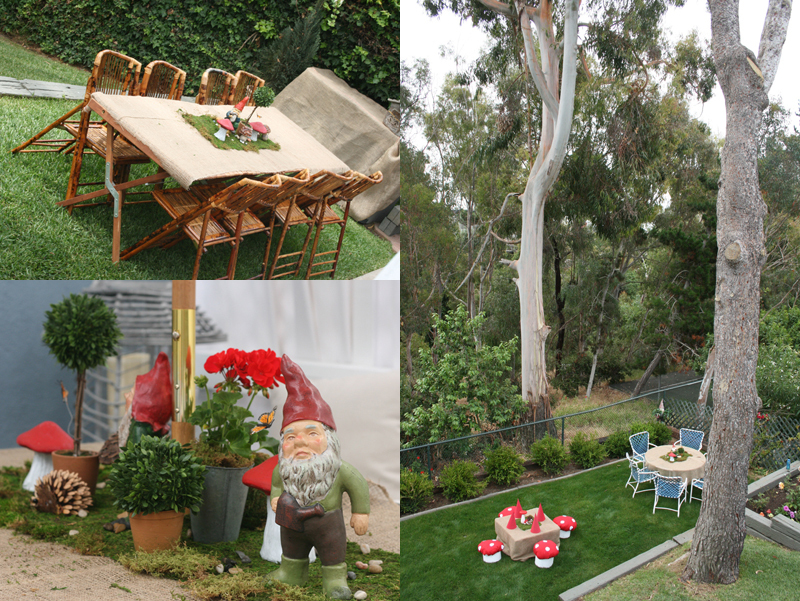 Look how cute the birthday boy is below: Their backyard was the perfect woodland setting. 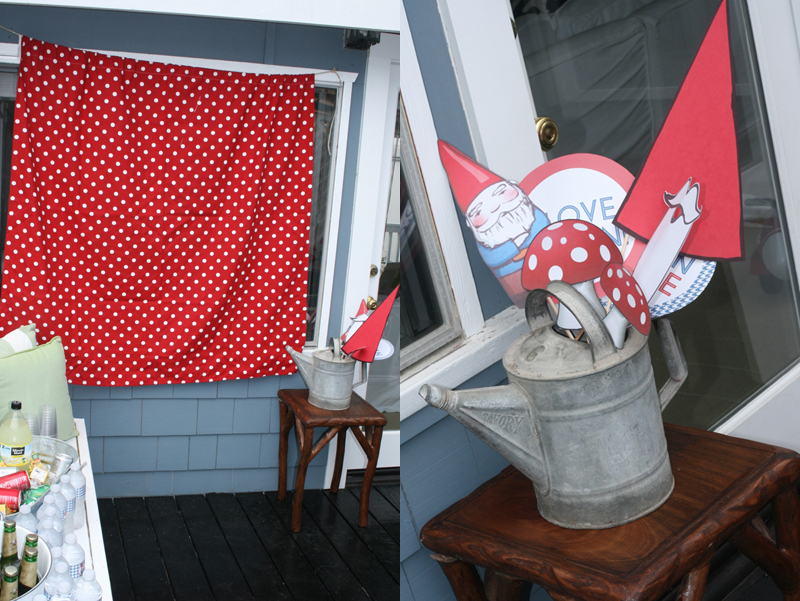 They put photobooth props in a watering can… …and got some pretty cute photos: The beard came from this amazing set by Jordan Ferney. (Ignore our photo! Our boys were sugared up, whining, and melting! Thank goodness this photo doesn’t have a soundtrack!) Kelly always does such a great job with food. Delish! 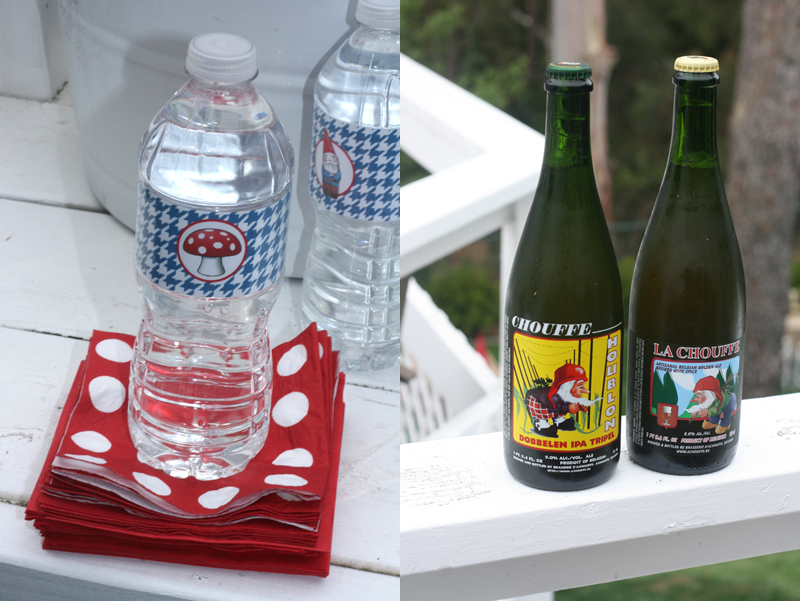 Leave it to my quirky bro to track down GNOME BEER! Where do you even find such things? So cute! But who needs food or drinks when you can have cupcakes? And look at the size of that beast my nephew had to eat. He ate the entire thing. (I’m kidding!) He was covered in red frosting by the time he called it quits! Cute little (G)Nolan! 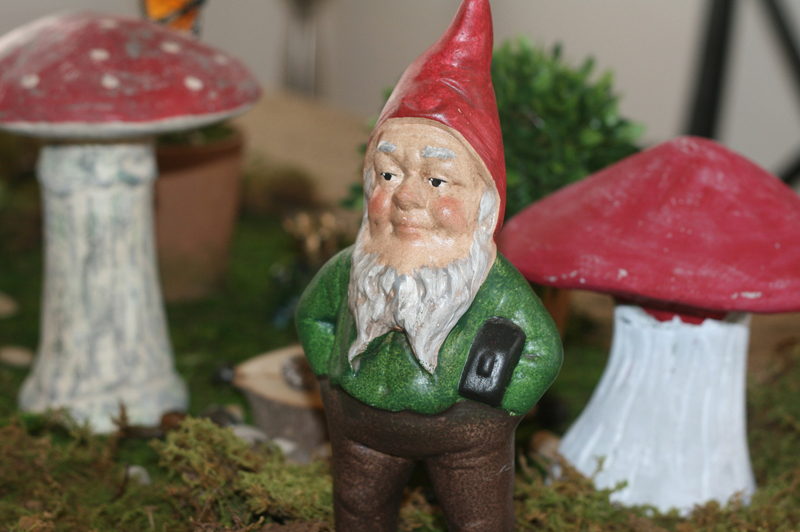 And can you get over this gnome candle? I love that it is a person’s job to make things like that! So fun! 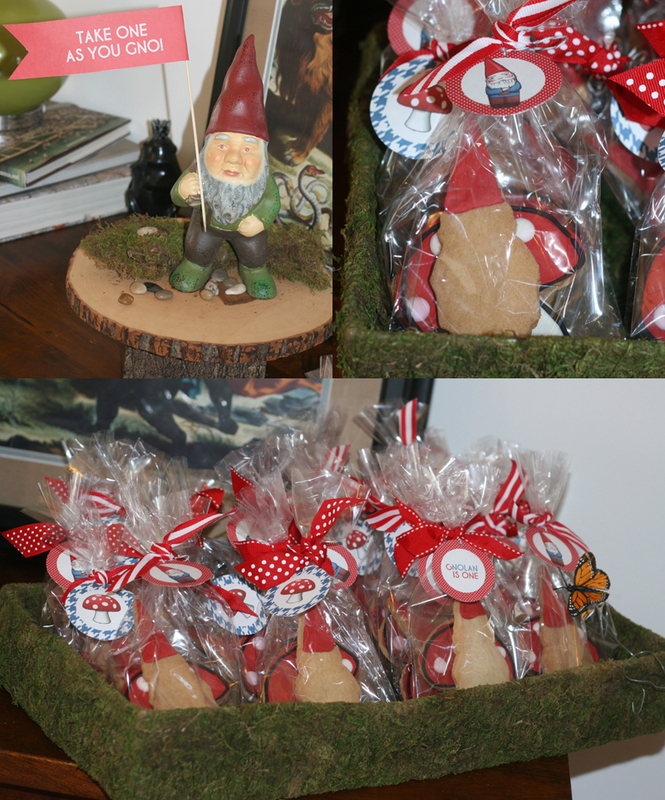 And as if this weren’t enough sugar for you, each guest got to take a cookie favor bag home. 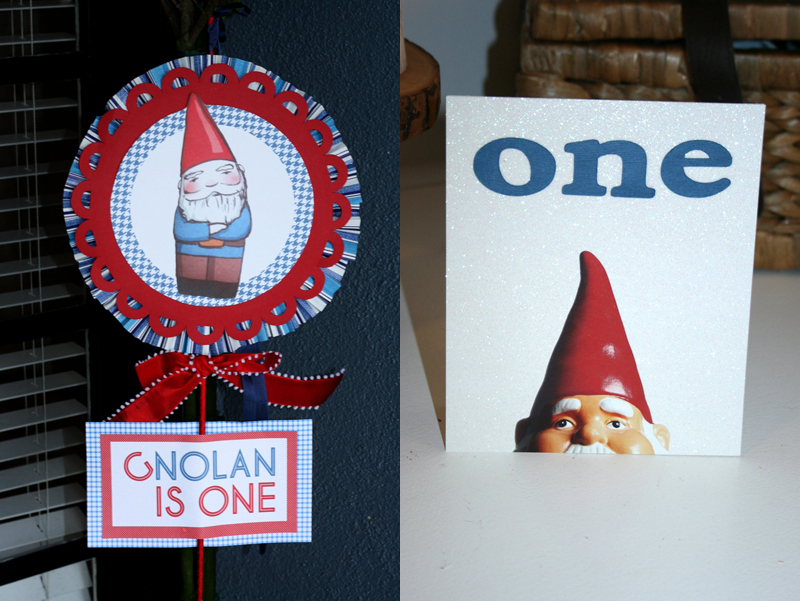 “Take One As You Gno.” Hee hee! Once again, my mom is the cookie genius! I don’t know how she does these so often, so well, and with such a steady hand… but I am sure glad I get to tap into her talents! I’m sure Kelly is too. 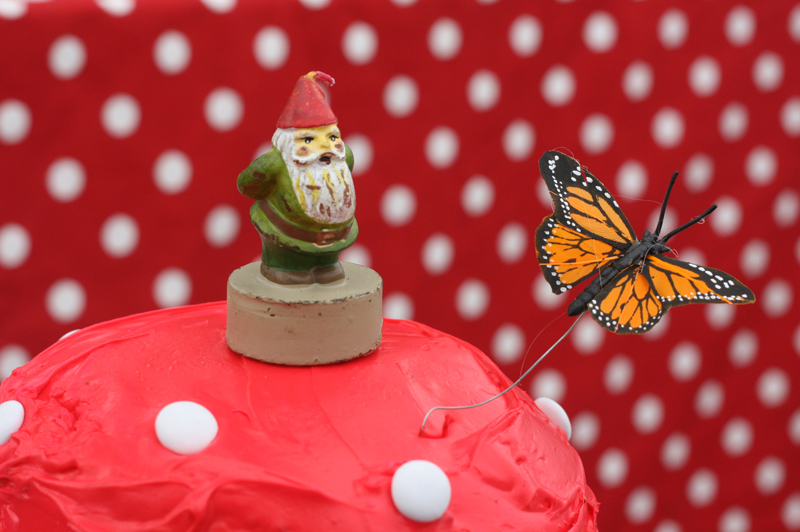 I love how she just frosted the gnome’s hat. Simple and cool. 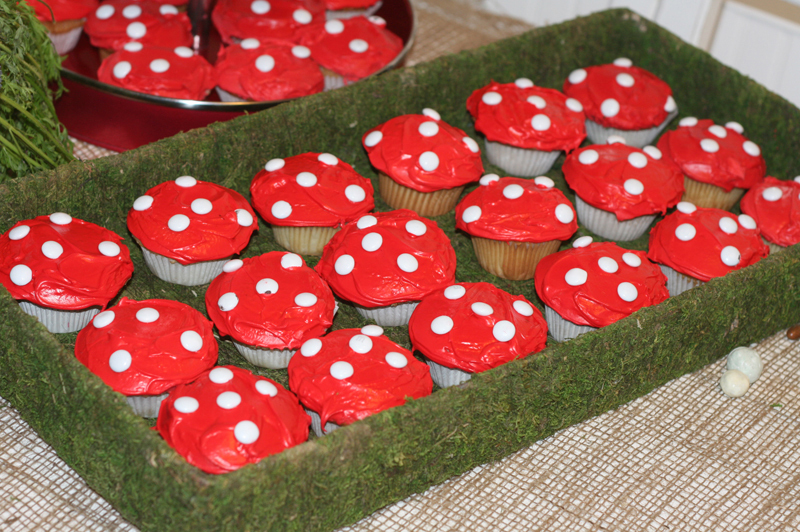 It was really a sweet party with so much heart and so much love for my little nephew. 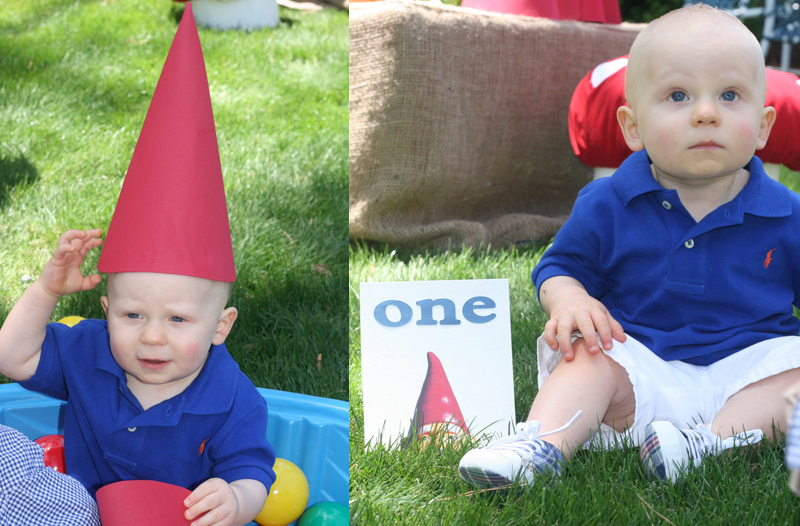 Happy first birthday my little gnomie! I hope you’ll remember what a cool party you had! 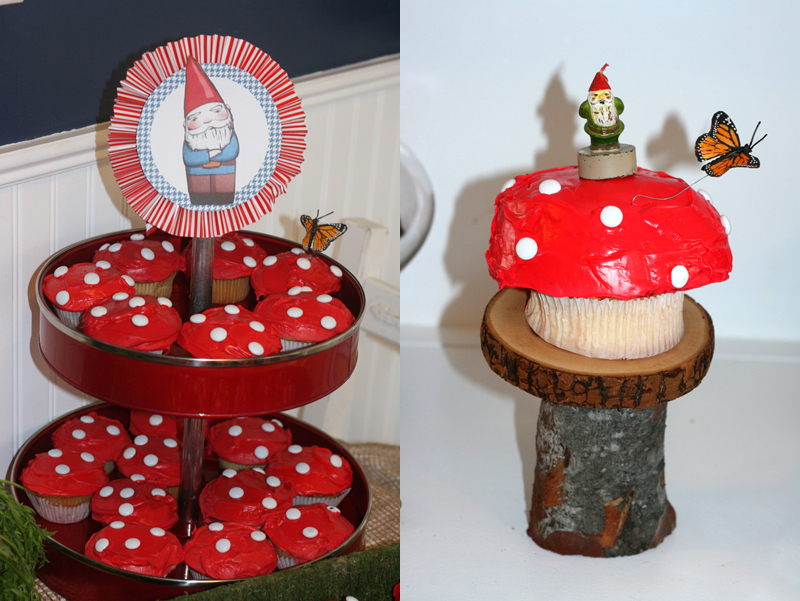 This entry was posted in kid's parties, parties for kiddos and tagged boy's first birthday theme, gnome party, mushroom themed birthday party, unique birthday theme, woodland party by Annika. Bookmark the permalink. G-never saw anything so “J R” adorable for his G-nolan’s firstie!!!! 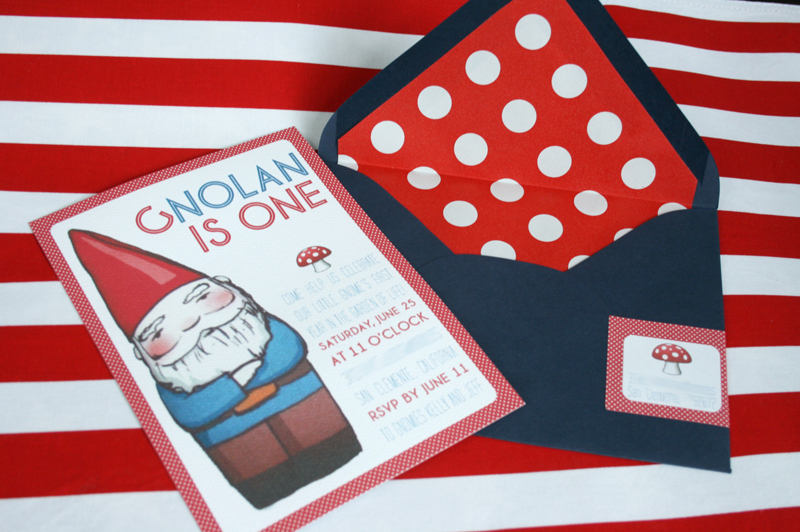 that kid’s table is wonderful and the invites are perfect! Dear Annika’s mom, you should totally have your own blog. : ) SO fun!!! What a great team you are! Very cute and creative. Love it. Where did the cute little porcupine or hedge hogs come from? Those stick porcupines are actually my grandmother’s and I think they were brought back for her from somewhere in Europe many moons ago! Too bad I couldn’t tell you “target!” They’re so cute, huh?